Following the reaction to the publication of the Granary book, we thought it would be a good idea to arrange a reunion of old friends and colleagues from the Granary days. 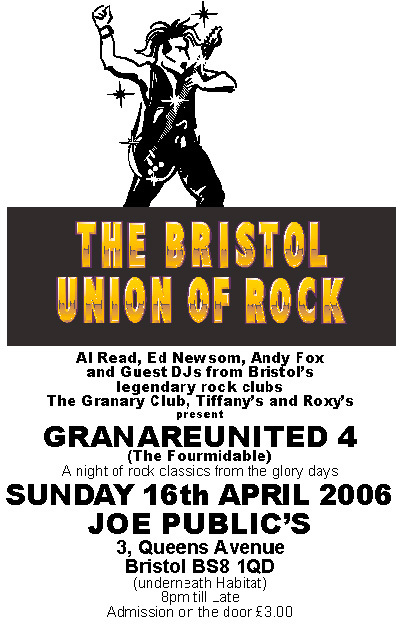 It turned out to be a bigger success than we had expected and now, several years later, events are held on an occasional basis that bring together former members, artists and staff of the Granary Club (affectionately known as ‘Gran Fans’) to indulge in a little nostalgia and wallow once again in the classic rock music that gave the club its legendary status. 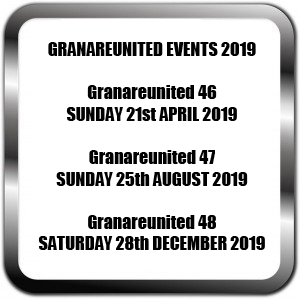 If you would like to be informed of forthcoming Granareunited events then add your name to the Gran Fans mailing list by filling in your email address in the side panel and press submit. 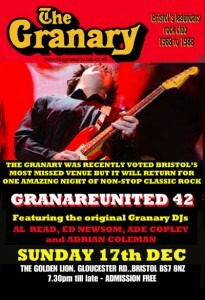 The first Granareunited was held at Cyrano’s, the bar situated in the cellars underneath the Granary itself. Granary Club memorabilia adorned the walls and the classic rock that made the Granary famous was revisited with wild abandon! 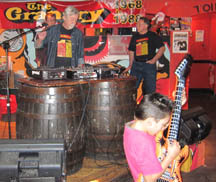 Five of the seven Granary DJs who featured at the club between 1969 and 1988 were present at the event. 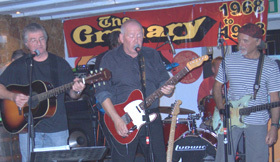 From left to right John Mason, Ed Newsom, Al Read, Adrian Copley and Andy Fox. Glenn Daniel and Adrian Coleman unfortunately couldn’t make it. 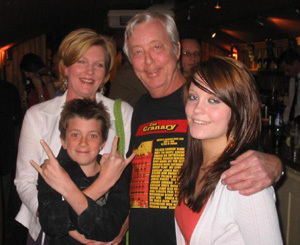 Al Read made it a family affair and was joined by wife Jenny, daughter Ellie and son Ollie. Granary fan A.J.Samuels was one of the lucky number at this invitation only event which was described in Venue magazine as “The hottest ticket in town!” and he took the following pictures. There was a full complement of Granary DJs on hand to re-create the music and the atmosphere of Bristol’s legendary rock club. 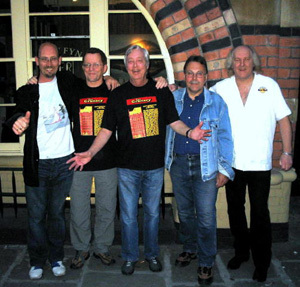 From left to right John Mason, Andy Fox, Adrian Copley, Al Read, Glenn Daniel, Adrian Coleman and Ed Newsom. 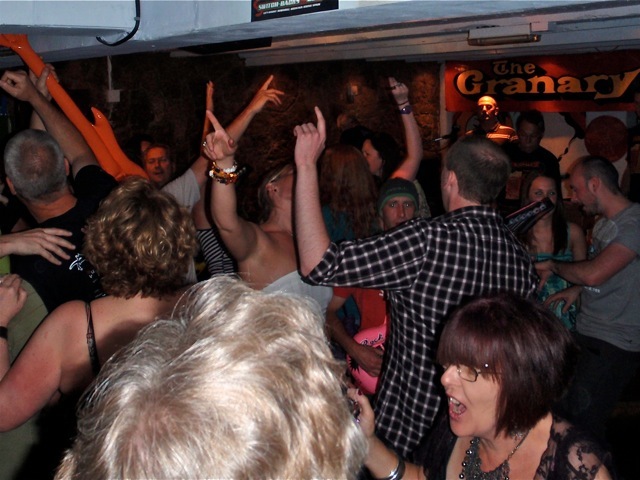 The awesome sound system of Panache was turned up to stun and the rock classics that turned you on during the Granary glory years were revisited. Other guys try to imitate us but the originals are still the greatest. A great time was had by all with the exception of Al who emulated crowd surfing without a crowd and spent the following week resting with a damaged foot. 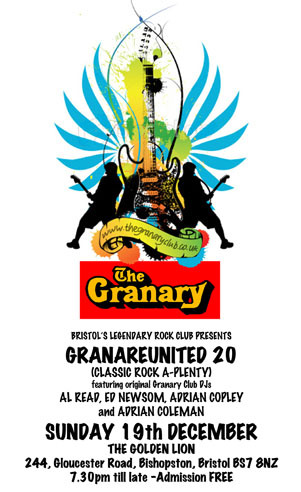 Granary reunion gigs are presented by former DJs of the Granary Club along with Andy Fox, the main man from Bristol’s other legenday rock venues Tiffany’s and Roxy’ under the associated title of The Bristol Union of Rock. It was titled CHRISTMASSIVE to put all and sundry into a festive mood. 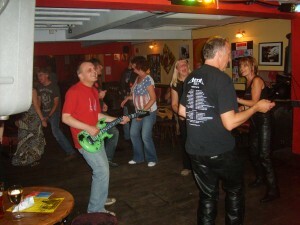 It was held at Panache and was a great success. 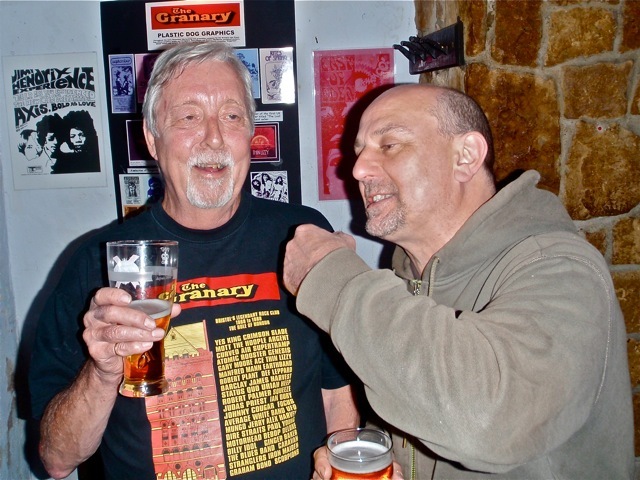 The evening started with a far out and truly cosmic selection of progressive rock tracks introduced by Super-Ed Newsom who was soon joined by Ade the First Copley who enticed the gathered throng on to the dance floor with some classic tracks including Free, The Who and Bad Company. 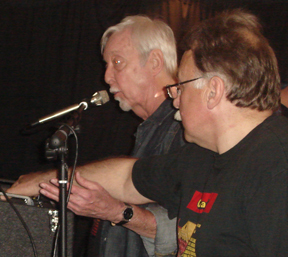 John Mason put in a short set of solid rockers followed by Al Read and Andy Fox who kept the evening rockin’ till the early hours. Here’s to the next one! 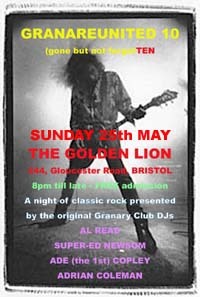 took place at the new venue -Joe Public’s underneath Habitat on Queens Road, Bristol .DJ Super-Ed’s early prog rock set was well received as was the truly heavy selection from DJ Adrian Coleman. 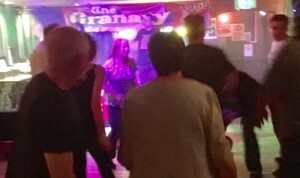 Al indulged himself in some well remembered Granary favourites including the NUTZ version of Bob Dylan’s “One More Cup of Coffee”.DJ Andy Fox once again proved that he’s the master of the turntables when it come to classic rock by filling the dance floor. Good one. Sunday 28th May at the Bierkeller in All Saints Street. 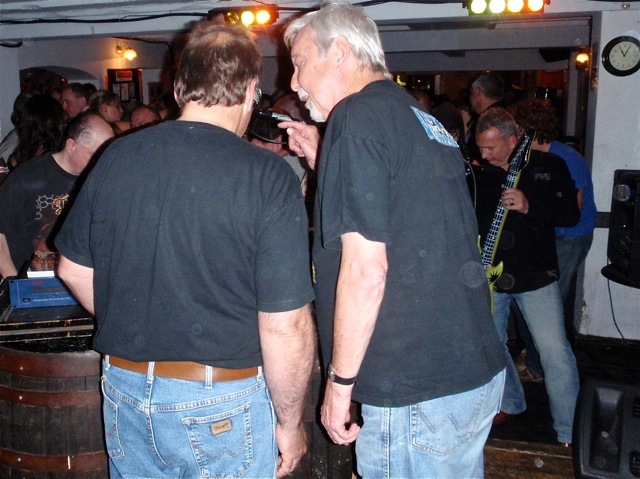 It was a good turn out for another get together of classic rock fans. Ed, Andy and Al (The Bristol Union of Rock) took care of business playing a wide range of sounds from the weird and wonderful prog rock of Tonto’s Expanding Head Band (thanks Ed!) to the guaranteed floor fillers of Lynyrd Skynyrd and Guns and Roses. 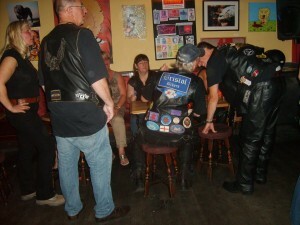 Our thanks to the team at the Bierkeller for their help and cooperation. Also a big cheer for the night’s guest DJAde the First (Copley) whose big grin lit up the stage and choice of the rock classics filled up the dance floor. Many said that this was the best to date, who am I to argue. 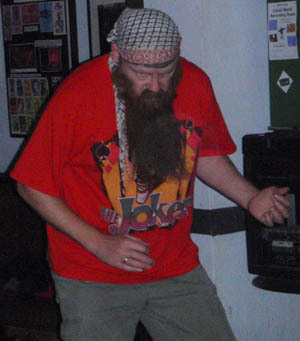 DJ Super-Ed opened up with examples of prog rock from bands that had played at the club in the early days. Adrian Coleman followed on with Aland Andy Fox rounding off the night. 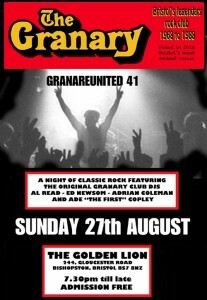 We’ll be back at the Golden Lion in August so watch for details. 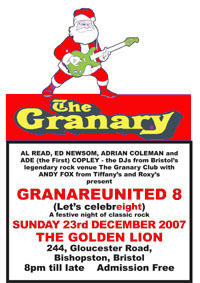 Held at the Golden Lion on Gloucester Road in Bristol it brought together five of the Granary’s original seven DJs as well as a good number of Gran Fans. 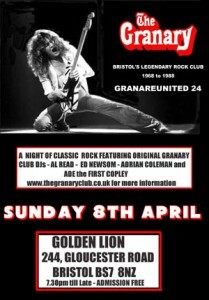 The best of classic rock presented in true Granary fashion made this a night to remember and a real reason to make sure that there will be many more of them to come. 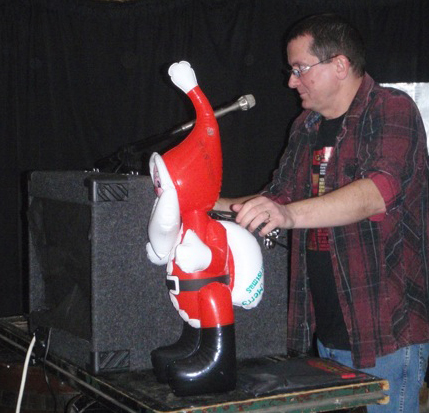 Al asks the audience to keep the rhythm going while he changes chord. No pics of prog rock DJ Super-Ed as he wouldn’t let anyone touch his newultra-trendy mobile phone camera . 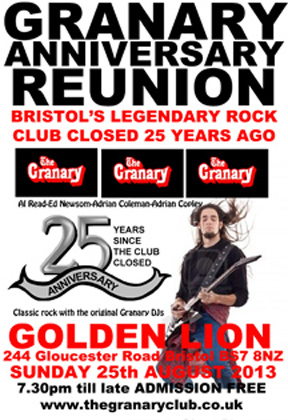 The Golden Lion is now the new home of Granary rock in Bristol - Granary fans saw to that on the day before Christmas Eve 2007. A packed venue made it a night to remember. 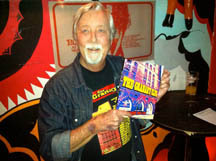 There were DJ sets from ADE THE FIRST, ADRIAN COLEMAN,SUPER-ED, AL READ and ANDY FOX . 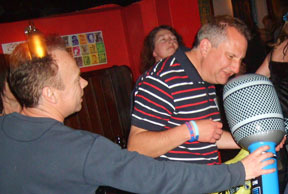 Photos show Ed steadying himself on the mike stand, the Gran Fans on the dance floor and Andy Fox about to bash Al and Ed’s heads together. Such fun! 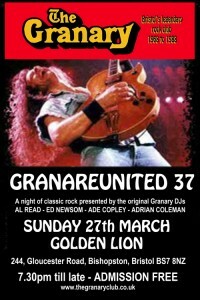 Another crowded night for the Lion on Sunday 23rd March 2008 as Gran Fans enjoyed masses of classic rock from the original Granary DJs. 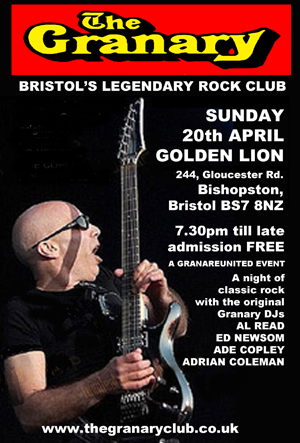 Super-Ed got the evening off to great start by featuring several live tracks from the recent Led Zeppelin concert, Ade the First drew many to the dance floor, Adrian Coleman followed on in the same classic rock style and then Al hosted the rest of the night with all the DJs picking the best of the floor fillers. The Lou Reed track “Perfect Day” ended a perfect night! 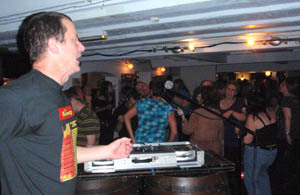 Despite falling head first off of the stage after tripping over a loose speaker cable at the start of the night Al continued through the evening along with the other DJs to ensure that everyone had a great time. A trip to hospital the next day revealed that Al had sustained a broken wrist, five broken ribs and a punctured lung - show biz in ‘arf tuff! Here’s some pictures of the night. 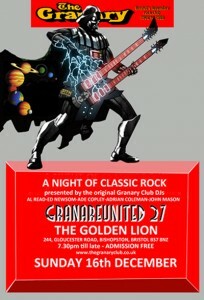 A different Granareunited on Friday 20th June with a “Live at the Lion” event. 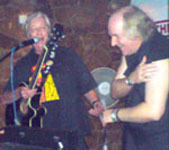 LOST ELEVEN are a fine rock,country rock and blues band fronted by Roger Slade (also of FLASH HARRY : at least 9 appearances at the Granarybetween 1981 and 1985) and Steve Webb (Al’s partner in running the Plastic DogAgency in the 70’sas well as fronting both ORIGINN and SQUIDD, progressive rock bands with 13 Granary appearances between them). 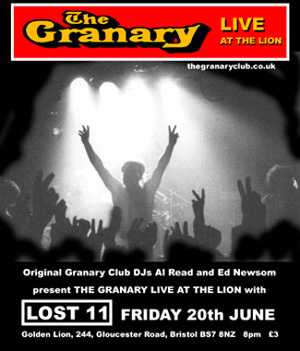 We rocked through the night with a packed Lion and also took a little time out to remember that it was 20 years ago that the club closed. 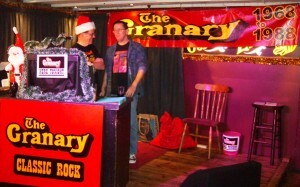 Everybody was chuffed toreceive the gift of a special Granary compilation CD. 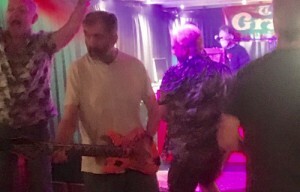 Al Read, Ed Newsom, Ade Copley and Adrian Coleman played face melting classic rock to the throngon the dance floor and we all agreed it, once again, was the best yet! 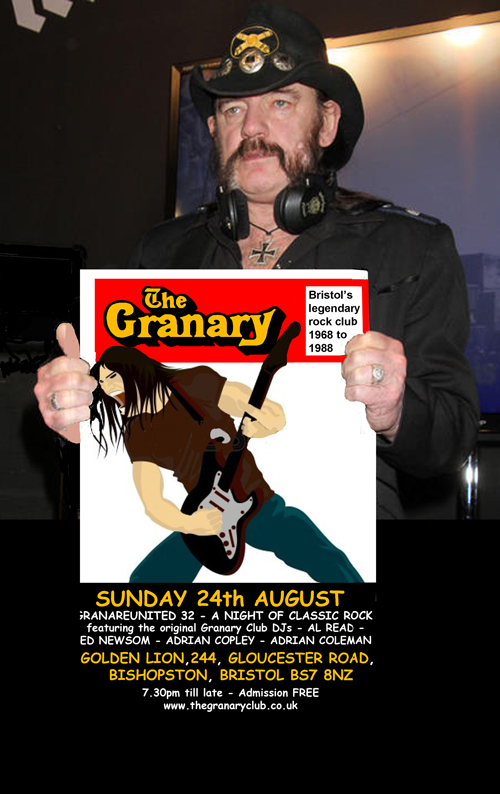 Celebrating the 40th anniversary of the Granary Club’s first rock gig backin 1968. The BBC were present to film the eventfor a special feature on their “Inside Out” series. Every one was treated to a Granary Key Ring asa momento and the Granary DJs did their stuff and provided one and allwith a night to remember. Al Read will notforget it as he tripped over a stray handbag and was taken off to hospital with a broken hip! After anoperation to replace the hip joint and several weeks recovery Al is said tobe looking forward to the next Granareunited gig but insists that handbags will be banned. 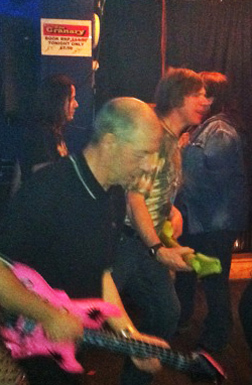 Perhaps it was the publicity surrounding the BBC TV “Inside Out” feature which gave us one of our biggest audiences to date.Al was extremely careful and survived the event without falling, tripping or crowd surfing without a crowd. As always DJ Super-Ed opened the proceedings with a mix of classic/progressive rock. 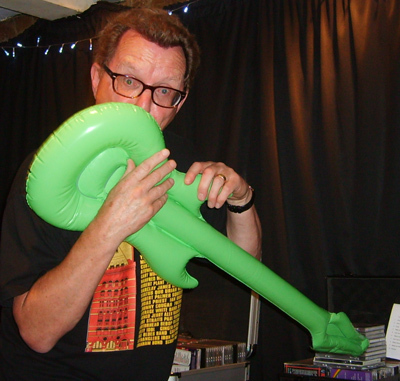 Ade Copley followed on with a stomping set of well known goodies, Al once again attempted a few comedy one-liners but found that it was safer to do what he does best and play some classic tracks. Good stuff continued with ace DJ Adrian Coleman and the the team came together to fill the dance floor with rock anthems and air guitars. 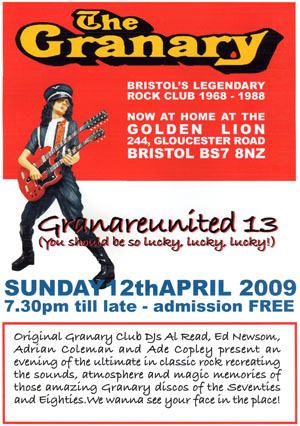 Granary reunion nights are usually held on the Sunday evening prior to a Bank Holiday Monday but on this occasion the original date would have coincided with the England versus West Indies cricket clash at the Gloucestershire cricket ground which is just around the corner from the new Granary home of the Golden Lion. A huge influx of Jamaican cricket fans at the close of match may well have created a clash of musical taste so we moved to the closest available Saturday. 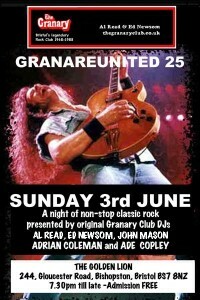 Many Gran Fans liked the move to a Saturday a the night proved to be another rocking success. 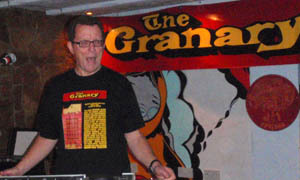 There was also a bonus with the unexpected arrival of missing Granary DJ John Mason. 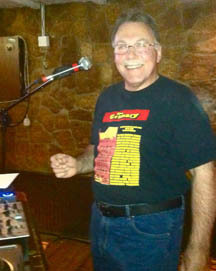 Hopefully John will be able to return at our next reunion and give us the benefit of a set of his choice of classic rock. 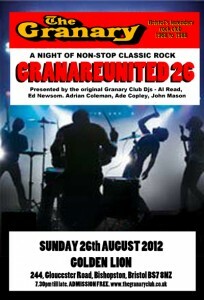 We’re really pleased with the turn out of Granary fans and friends at our re-union nights. 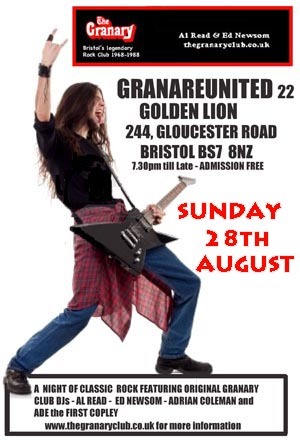 This one was as good as the last and it gives us plenty of reasons to carry on giving Bristol the chance to really indulge in some good old fashioned rocking every now and then. Here are some pictures taken during the night which gives you a pretty good idea of the electric atmosphere. Probably the best to date with a full club and many reports from Gran Fans of a truly great night. I know we keep saying “It was the best yet” but this one was truly as good as it gets. 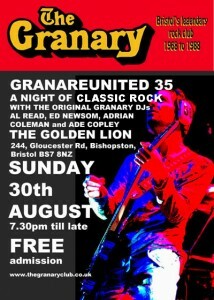 The Lion was packed and the place rocked in true Granary Rock Disco style. 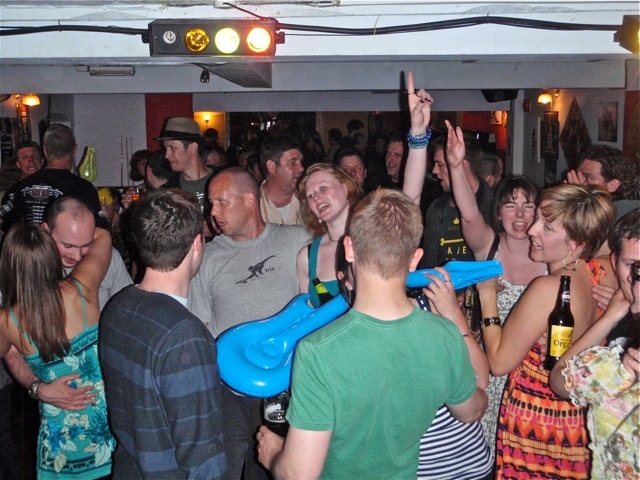 Our thanks to your generosity when the bucket went round as the cash helps keep the rock nights going, paying for the upkeep of the web site and also helped to buy the DJs a well-earned pint and a packet of pork scratchings. 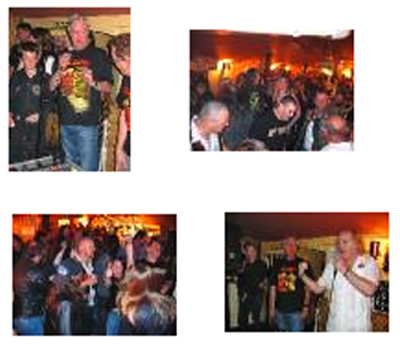 DJ Ed Newsom started off yet another great evening with a selection of tracks featuring some of the ‘pub rock’ bands that appeared at the club in the 70’s. 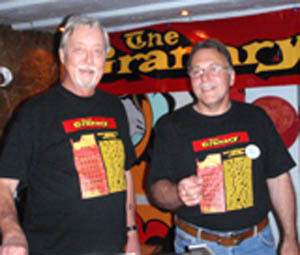 Ade the First and Adrian Coleman played some of their favourite tracks whilst Al Read reminded all that the Granary book had nearly sold out with less than 20 copies remaining. 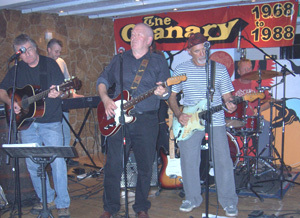 Air guitars were to the fore when the four Granary DJs joined together to present a couple of hours of pure classic rock which finished up with the crowd chanting for more. A blast of AC/DC’s “Whole Lotta Rosie” brought the night (but not the chanting for more) to and end. It don’t get better than this! “What’s that on the ceiling?” the crowd cry. “Where do we plug these guitars into?” the girls want to know. It was a good one yet again. All four Granary DJs worked together on a great set of classics that kept the dance floor full of happy Gran Fans. Individual sets from Ade and Adrian included many requested tracks which were well appreciated. Ed treated us to a mass of god stuff from the the artists who had appeared at the Granary back in the glory days whilst Al thoroughly enjoyed himself playing some of his favourites whilst reminding everyone that there were copies of his book and Granary T-Shirts on sale at knock down prices! The country was in the grip of snow and ice so numbers were down on previous Granareunited events. However, those that were there made sure they enjoyed themselves and were chuffed to bits to find that DJ Super-Ed had turned Santa Claus and provided a free lucky dip. T-shorts for Gibson guitars, the Doors and the Rolling Stones were picked out as well as CDs from Dylan, Clapton, AC/DC and many other classic rock luminaries. 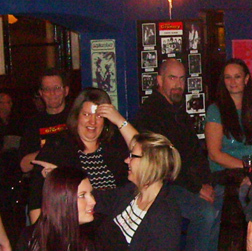 A really good crowd turned up for a rock packed evening of classic tracks. 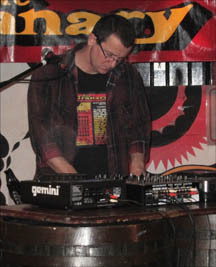 Individual DJ sets featured a wide choice including Jimi Hendrix from Ed to the Foo Fighters from Adrian. 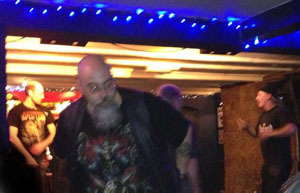 The mass set from all 4 DJs packed the dance floor from the start with Whitesnake to the finale from Lynyrd Skynyrd. 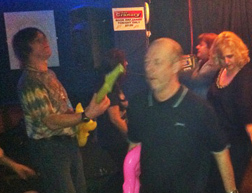 Much fun was had with the blow up air guitars and a surprise blow up microphone supplied by Granary friend “Sooty” (bottom picture left). Everybody had a damn good time. Al, Ed. 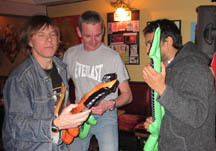 Ade and Adrian followed the classic rock rule book by selecting only the best of classic rock. Adrian, Ade and Al crowd behind the decks awaiting the right moment to distribute the air guitars. During the afternoon the Lion had several stalls around the venue selling a variety of goods including Al’s daughter Ellie with her well attended cake stall! The evening got underway with Al organising which mind blowing tracks to play for a massed audience of one air guitar playing Oompa Loompa! The air guitar idea soon caught on and everyone got in on the act. 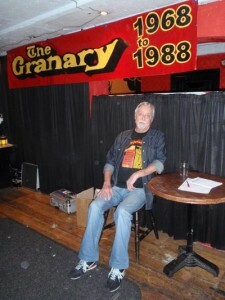 Al tried hard to persuade the audience to buy a copy of the Granary book but everyone seemed to have a copy already. 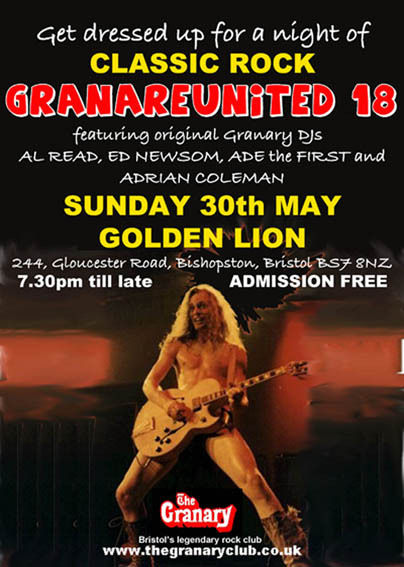 All agreed that the Lion was truly rocked in the tried and tested Granary style and the motion was passed that we should all meet up again on Easter Sunday to do it all again but even LOUDER!! 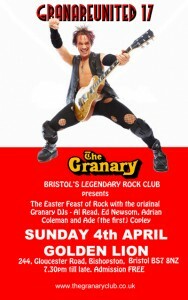 An Easter Sunday rock out which started with DJ Super-Ed with a set that featured tracks by many of the great bands that played at the Granary during the glory days. 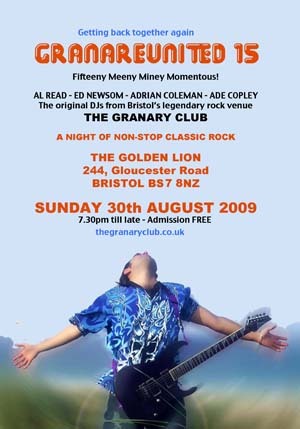 Ed was followed by Ade the First, Al Read and Adrian Coleman. 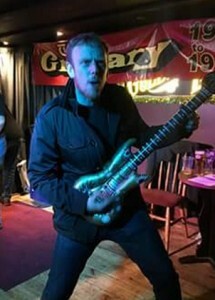 Adrian was surprised when his set was interrupted with the presentation of a 50th birthday card signed by many of the fans at the Lion. 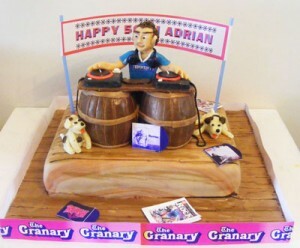 His surprise was added to when a celebration cake arrived which had an edible Adrian figure at the DJ decks on top. Happy Birthday Adrian! 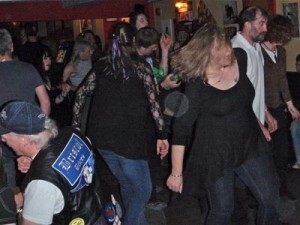 The dance floor steadily filled up as classic rock track after classic rock track pumped out of the Lion’s speaker system finishing up with “Stairway to Heaven” and “Free Bird”. Great! Al apologises for spending most of the night in a chair as his poor little legs are mighty painful at the moment. Hopefully a bit of treatment should see him back at the turntables before long! Not officially part of the Diamond Jubilee celebrations but a worthy addition to the festivities. 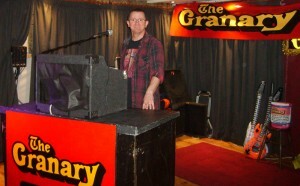 Granary DJ John Mason returned to the Granareunited stage to present a fine set of his memorable Granary tracks. The crowd was a little thinner on the ground than usual but only to be expected with so many other events going on during this Jubilee weekend. 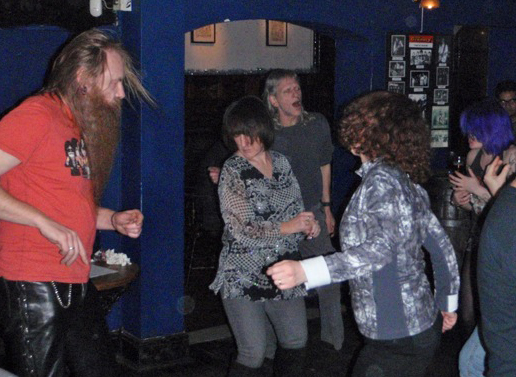 There were however more than enough Gran Fans on the the dance floor to ensure a good time was had by all. Yet another great night to add to our ongoing list go “great nights”. DJ SuperEd kicked off with a set that was mostly made up of tracks by bands that had played at the Granary back in the glory days. 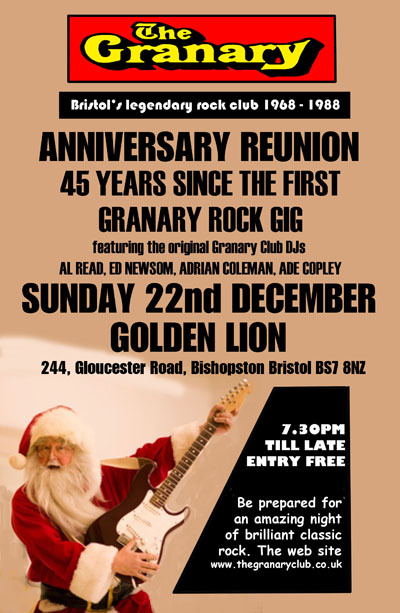 DJ John Mason, DJ Ade the First Copley and DJ Adrian Coleman plus interruptions by Al Read took the rocking through till 11pm. Then the floor fillers really got everyone going with a solid hour of danceable classics. Here are some pictures that catch some of the action. 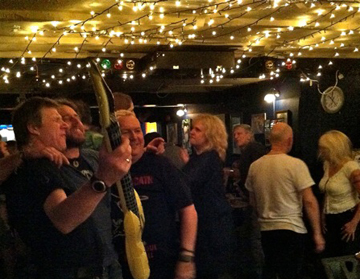 Our Christmas 2012 gig went well despite being on a Sunday that preceded a working day. Numbers were down slightly so we learnt our lesson and in future we’ll plan things so there’s always a recovery day following a heavy drinking gig! 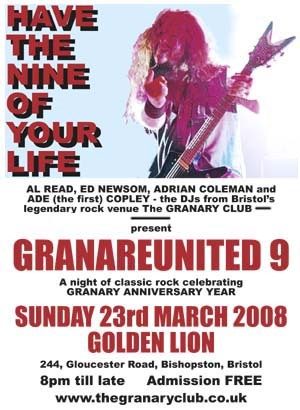 Great sets from the Granary DJs Super-Ed, Ade the First and Adrian the Coal Man with Al interrupting to offer some awful jokes and some classic Granary tracks. 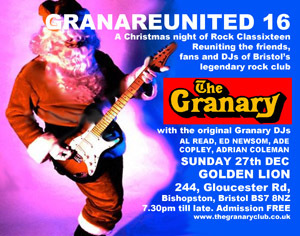 A framed 1970’s Granary poster was the prize for a for a free raffle and everyone went home with a free gift from Santa Super-Ed’s sack. 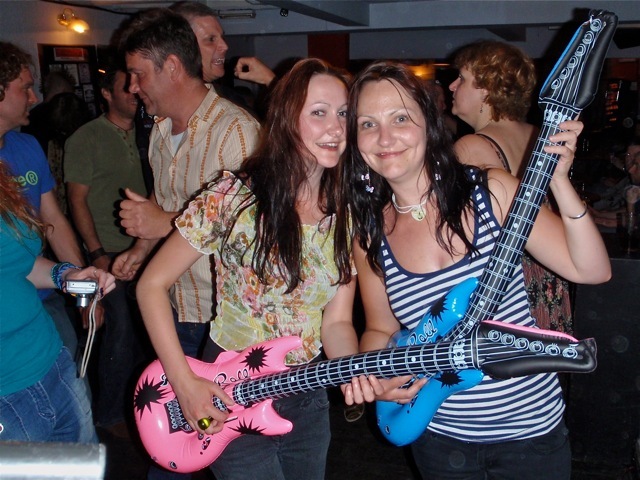 Gran fans at Granareunited 27 are obviously thrilled with their free blow up guitar. 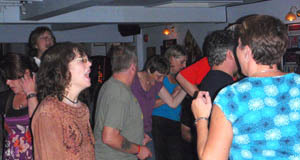 Gran fans including DJ John Mason (left) venturing out on to the dance floor. Following the accepted tradition DJ Super-Ed started off the evening and his first track “In the Court of the Crimson King” proved that classic rock is alive and well. Ed also included a great track from the new (and long awaited) David Bowie album. 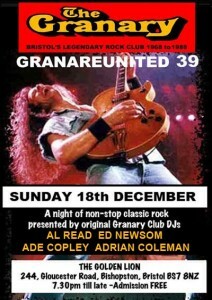 DJ John Mason is now the senior barman at the London in Bedminster so was unable to attend this Granareunited. Al stood in for John and kicked off with tracks by 38 Special and Blue Oyster Cult. Ade the First was next and Adrian (here’s the Foo Fighters) Coleman took us through til 11pm. 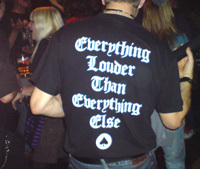 Then came the “Floor Fillers” which did what it said on the CD and got everyone rocking for all the were worth. Hoping you can all return for the “25th Anniversary since the club closed” in August. 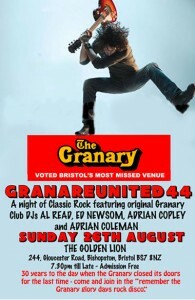 DJ Ade the First in the background right underneath the Granary poster. 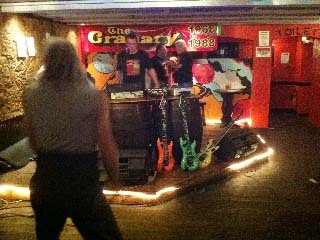 A collection of pictures from Granareunited 28 showing the Gran Fans amazing prowess on the air guitar! Not only one of the biggest crowds ever (bless you all) but also the BBC were there recording for a radio documentary about the Granary Glory days. 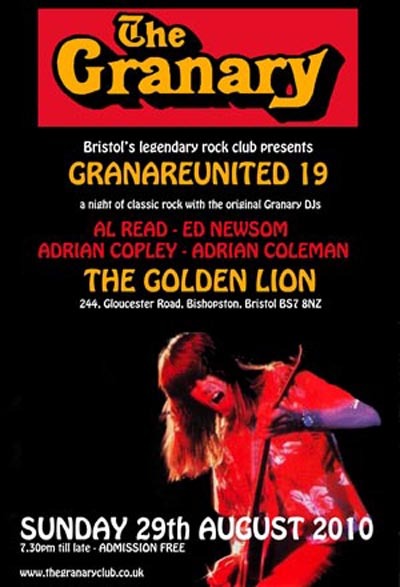 A great selection of classic tracks played by Granary DJs Ed Newsom, Al Read, Ade Copley and Adrian Coleman, all were in great form. 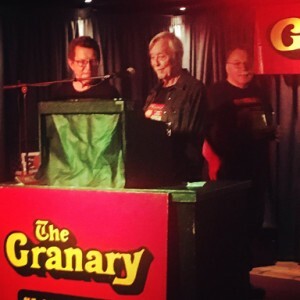 A free raffle was held where selection of T-shirts (including a unique Granary new wave and punk t-shirt) plus a framed print of the Granary and several genuine Granary posters from the early Seventies were the brilliant prizes. 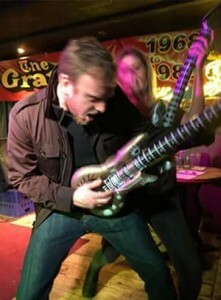 DJ Super-Ed gives an impression of Jimi Hendrix playing the guitar with his teeth! 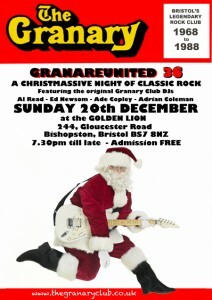 Another excellent Granary night full to the brim with classic rock plus the, now regular, appearance of Santa Super-Ed with the big red Lucky Dip bag. Christmas hats were passed out and newly printed copies of the December 1970 Dogpress were a special memorabilia gift to all. 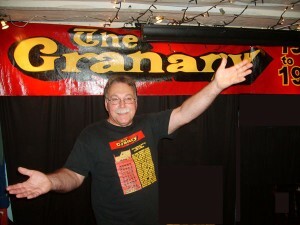 Gran fans were hugely generous in the cash collection to help fund the Granary events and the web site. We are now looking forward to Easter 2014. The Granary “floor filler” tracks do just that as the pictures certify! 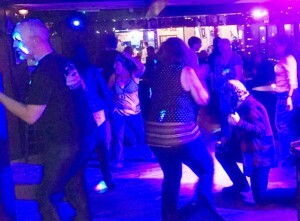 Our Easter Sunday reunited event was a blast, a good crowd filled the dance floor virtually all night. We must thank you for the collection which covered the costs of the the web site and newsletter mail for the year. Here’s some pictures taken on the night. Hope you like them. It’s unsure what Al is up to and the confused look on the faces of DJ Ed Newsom, DJ Ade Copley and DJ Adrian Coleman confirms this. 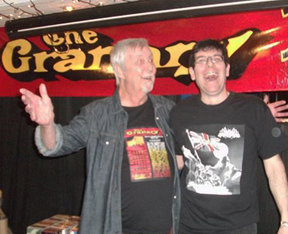 Al posing with Jezza Locke who’s not only a Gran Fan but also a big follower of the band Spider who appeared many, many times at the Granary. 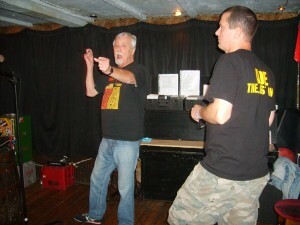 DJ Ade points out to Al that if he presses the red button nuclear war breaks out in Bishopston! 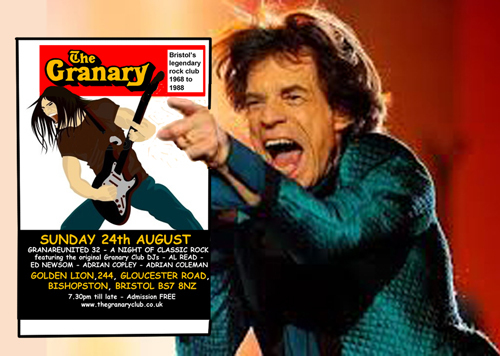 A spot of Photoshopping gave the poster for this gig a new look. 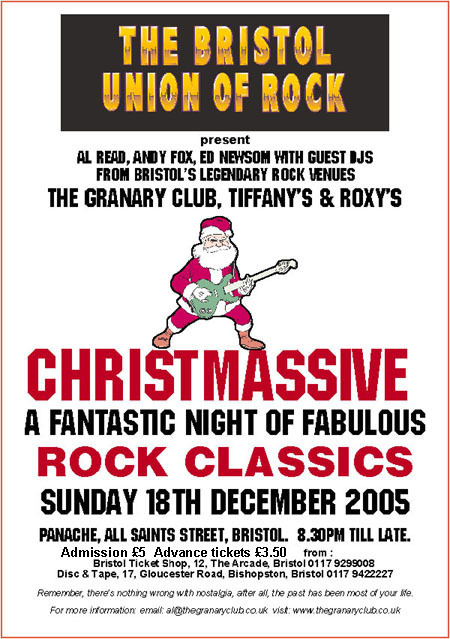 This bit of jolly publicity attracted a good crowd for the gig, a fine time was had by all and we agreed to do it all again at Christmas! 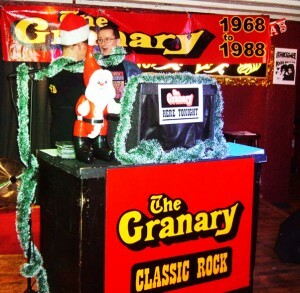 The Christmas gig is always a jolly one with Santa and his lucky dip sack, sparkling sets from all four of the Granary DJs and a selection of classic rock floor fillers that had everyone dancing and head banging. Only thing missing was a camera though Al managed to capture a pose from Ade the First before his camera battery died! See y’all again at Easter 2015. 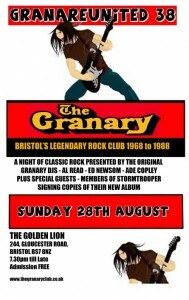 Running out of new ways to tell you that the Lion rocked to another evening crammed full of rock classics. 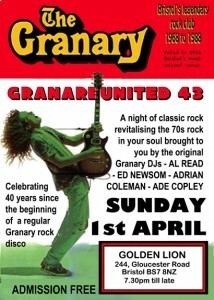 It was as enjoyable as ever and we promised to keep the Granareunited nights a regular feature of the Lion’s entertainment events. 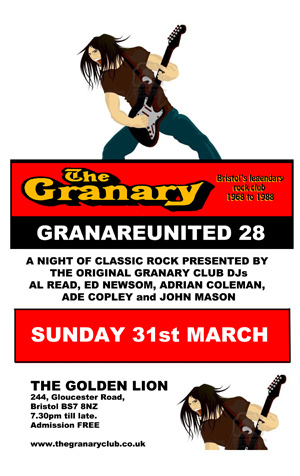 The new management at the Golden Lion were pleased as Punch with 35th Granareunited celebrating 10 years of the Granary reunion nights. 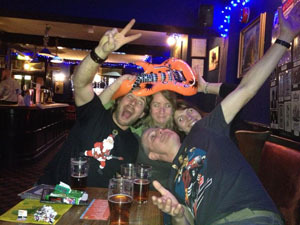 Comments on the Facebook page included : Dave “Nice friendly landlord who chatted about rock music with us. Another great night to meet like minded friends. Alan “It was brill as usual”. Bill “Thanks for that one”. 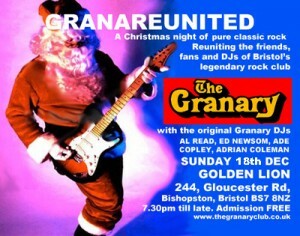 Looking forward to Christmas week and the next Granareunited. 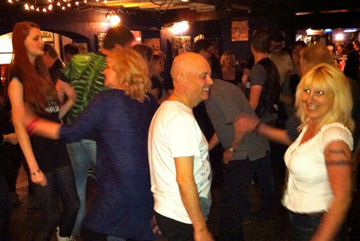 A thoroughly enjoyable evening for all with great music that kept the dance floor packed. 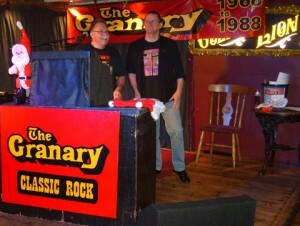 The Granary banner and new disco frontage made the stage set look good and the Granary DJs happily obliged with a number of audience requests. 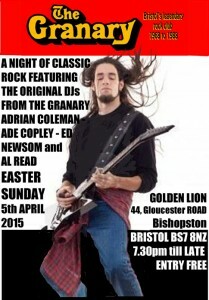 The Golden Lion was pretty much packed out for our Easter event and the reviews said that it was an enjoyable night! Al and Ed glowing in the ever changing stage lights. The sound system is really top notch and provides a real punch. 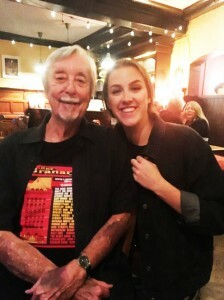 Yet another great evening in the continuing series of Granary reunions. We had the company of members of STORMTROOPER who are on hand to sign copies of their album “Pride Before a Fall”. Lost since the days of Stormtroopers many appearances at the Granary but now found and released as a perfect example of classic rock. Al Read was suffering from a strained back and had to spend the night seat bound but promises to to up and active for our next reunion on 18th December 2016. See you then! 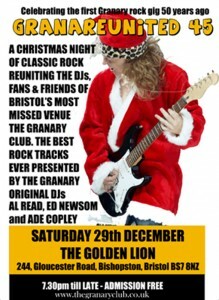 A really enjoyable night with DJs Al, Ed, Ade and Adrian in attendance. 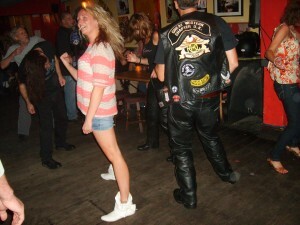 Pretty good crowd too and a constant stream of classic rock kept the dance floor full. Santa’s Lucky Dip provided one and all with either a CD or a DVD and donations in the bucket will keep the Granary web site going for another year. 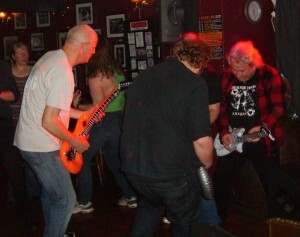 The crowd do some rocking before returning to the bar for more Newcastle Brown. 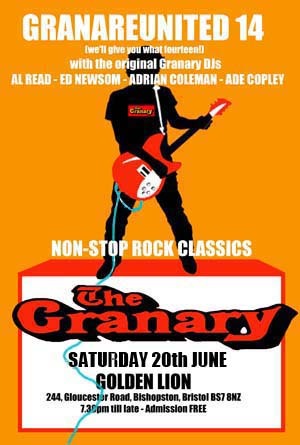 A quote from “Dee Teedious” on the Facebook Granary page the following morning said “Bloody great night chaps, great crowd, great choons, see you next time, Cheers!” We can’t argue with that, it was a most enjoyable and well attended gig. See you next time Dee. 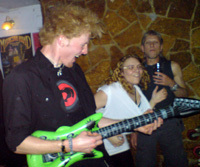 Air guitarists battle it out on Wishbone Ash “Blowing Free”. I think it was a draw! 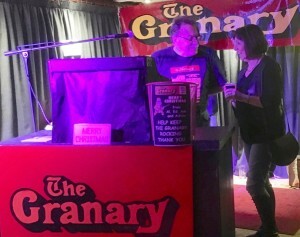 Everybody was pleased to see Granary DJ Adrian Coleman playing his part in making the night a success as he now has to travel from his new home in Wales. 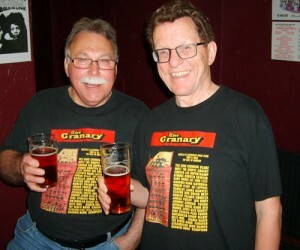 Granary DJs Ade the First and Super Ed display matching T Shirts and pint glasses. DJ Al missed the photo session as he was sat down with a bad foot. It was a rather splendid summers day which meant that everybody was out and about and were a little late getting into the club. 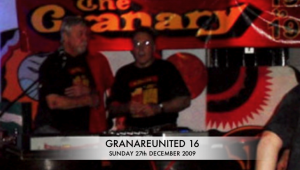 However the Gran Fans did make it to the reunion and the solid selection of ’floor filler’ tracks made the latter part of the night another memorable replay of a typical disco night at the Granary. 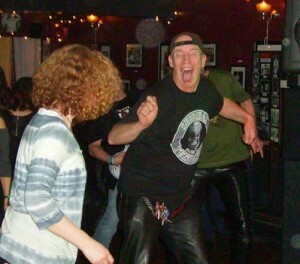 Ed pictured a few dance floor moments as the air guitar artists did their thing. A jolly Christmas gathering with a welcome number of new faces. Good to receive the pats on the back from the management of the Lion who love our gigs and the Gran fans enormous appetite for the pub’s beer. Gran DJs Ade and Adrian discuss whose turn it is to buy the first pint. 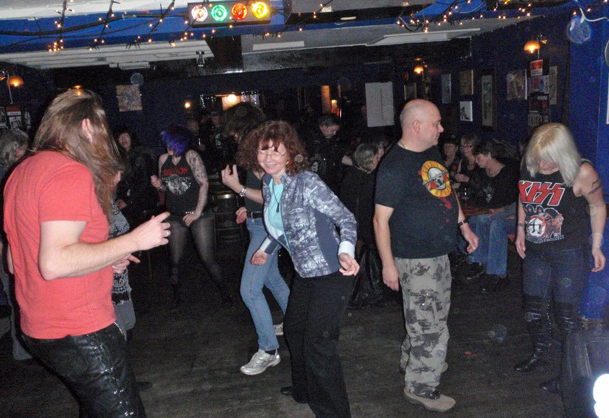 Gran fans doing their dance floor thing to one of our vast collection of rock classics. 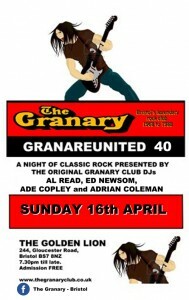 The Granary DJs look forward to seeing you April 1st next year. 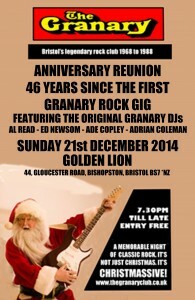 We know it is getting boring but the standard of the Granary reunions is pretty consistent ….. GREAT! 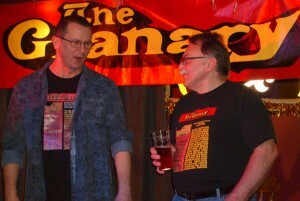 Al and Ade deep in discussion over whose turn it is to buy the first pint. Every night starts like this. My word, there’s now two of them. 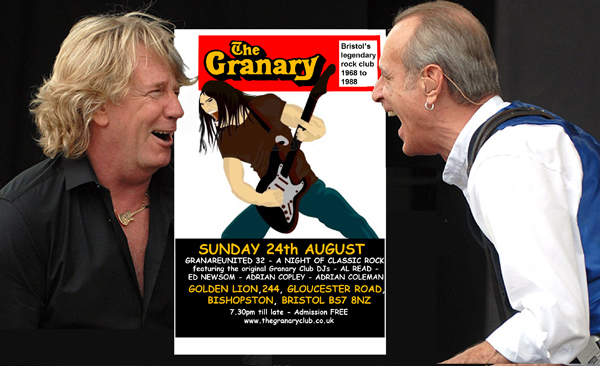 I bet there will be loads of them at our next Granary reunion which will be on Sunday 26th August 2018 - see ya! 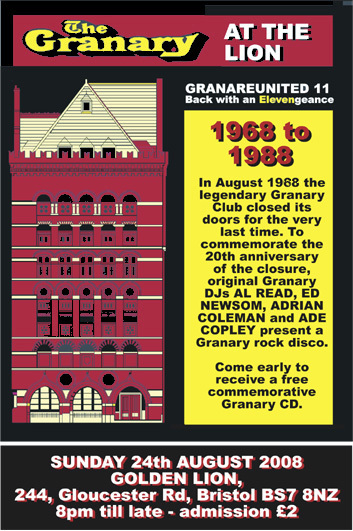 Would you believe it is 30 years since the Granary closed its doors for the last time. 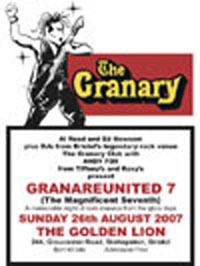 It is good to know that the club is not forgotten as proved by the great gathering of Granary fans every time we have a reunion. 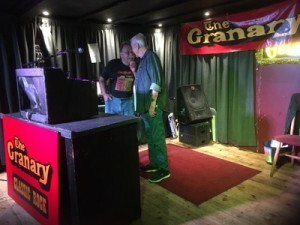 Our latest on the 16th August saw a good crowd enjoying the night packed with classic rock tracks bringing back memories of those glorious Granary days. A fine night for Al too as he was joined by grand daughter Evie who was there celebrating her acceptance into Paul McCartney’s Liverpool Academy of Dramatic Arts. Go girl! 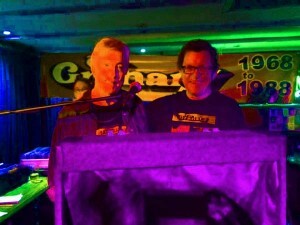 And here are Gran DJs Ed Newsom, Al Read and Ade Copley pictured in stage at the same time. Usually they’re all at the bar or in the toilet.